The saints who are assigned immediately following Christmas are honored because of their special connection with Christ. December 29, the Feast of Saint Thomas Becket, Archbishop of Canterbury, who was martyred in his cathedral by the soldiers of Henry II in 1170, is the true anniversary date of his death. Because of the great shock and sensation that this martyrdom caused at a time when all of Europe was Catholic, the Roman authorities, in the thirteenth century, deemed it appropriate to assign the celebration of his feast within the privileged days of Christmas week, thus adding him to the group of "Christ's nobility." In the Middle Ages, Christmas week also assumed the note of a hallowed time within the homes of the faithful. Many observances of a religious character were introduced locally and spread over large sections of the Christian population of Europe. For the farmers and their animals it was a time of rest and relaxation from laborious work; only the necessary chores were done in stable and barn. Thus the whole week became a series of holidays. More time than usual was spent on prayer and religious exercises. It is still the custom in many sections of Europe to light the candles of the Christmas tree every night while the whole family says the rosary or performs some other devotion, followed by the singing of carols. Carol singing from house to house is an ancient tradition in central Europe on the twelve nights between Christmas and Epiphany. The Poles call these nights the "Holy Evenings" (Stoiete Wieczory). Another widespread practice is the performance of religious plays portraying events of the Christmas story (such as the Nativity, the visit of the Magi, the flight into Egypt, and the massacre of Bethlehem). In southern Germany and Austria many such plays are still performed in rural communities. Among the northern Slavs (Poles, Ukrainians, Czechs, Slovaks) a puppet theater (szopka) is in vogue; its religious scenes alternate with secular dramatic exhibits. 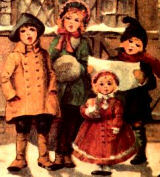 In the cities of Poland children put on Christmas dramas (jaselka). A similar performance (Bethlehemes jatek) is done by children in Hungary; a representation of the manger is carried from house to house, little dramatic plays are enacted and carols sung. Today would be a good time to gather with family and friends enjoy some Christmas goodies and spend an evening singing Christmas carols.